Developed by Rebellion Developments, Sniper Elite is a tactical third person shooter set in the war torn times of World War II. The series revolves around the story of American OSS agent Karl Fairburne who is sent on high profile and life threatening mission deep within enemy lines. The Sniper Elite series has been going from strength to strength with Sniper Elite 3 taking the tactical shooter genre by storm. Sniper Elite 3 also included an X-Ray kill cam which has been a favourite feature for both fans and newcomers to the series. Where will Karl Fairburne go next? Find out below. At it’s core, Sniper elite 4 is a 3rd person tactical shooter. As the name suggests a lot of the game play is based around sniping and picking off your enemies from great distances, stealth plays a massive part in the game too as a lot of the mission require you to be a silent assassin. We have listed the weapons that have been featured in the pre-alpha gameplay that was showcased at E3 2016. What is the Zombie Army Trilogy? Zombie Army Trilogy is a departure from the usual Sniper Elite storyline. The Sniper Elite Zombie Army Trilogy is treated as a stand alone series which is set within the same universe. 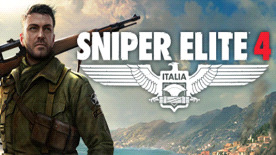 Sniper Elite takes place in the year 1945 and follows protagonist Karl Fairburn, an American agent working for the Office of Strategic Services (OSS). Karl is given the mission to prevent the Soviet Union taking control of Germany’s nuclear secrets in and around Berlin. Karl is once again sent on a mission to Berlin and is tasked with a mission to track down key individuals who are involved in the development of the V-2 ballistic missile. In case you were wondering, yes, Sniper Elite 4 will be releasing a collector's editon of the game on the 14th of February. The good news is that it is packed full of awesome Sniper Elite 4 goodies.